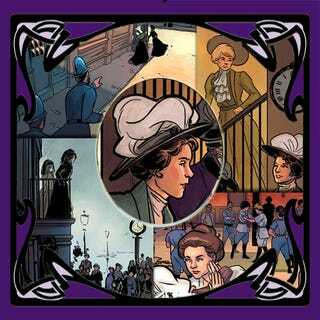 The soon-to-be-released graphic novel trilogy Mrs. Pankhurst's Amazons will mark the centennial anniversary of history's most extreme battle for women's rights. By the early 20th century, the fight for women's suffrage - not just the right to vote in elections, but the emancipation of women at all levels of society - was reaching a fever pitch. Matters had come to a head in the infamous "Black Friday" riots of 1910, a three-way running battle between suffragette protesters, angry bystanders and police constables that raged through the streets of central London for nearly six hours. After over four decades of polite but fruitless negotiations with successive governments, the suffrage movement dramatically split in two. One faction advocated the continuation of peaceful political lobbying; the other, led by the dynamic Emmeline, Christabel and Sylvia Pankhurst, resorted to civil disobedience, mass vandalism and other radical protest tactics. The militants were quickly labelled as "terrorists" by the conservative media, although they went to extreme lengths to ensure that no-one was physically harmed as a result of their protests. During 1914, however, the escalating conflict between the radical suffragettes and their government became very dangerous. Suffragettes who were arrested during protest actions considered themselves to be political prisoners and resorted to hunger strikes while imprisoned, effectively forcing the government to respond by ordering them to be force-fed. The image of "respectable" women being force-fed in jail shocked the general public and swung opinion in favor of the suffragettes' cause. The government then created the so-called "Cat and Mouse Act", which allowed starving prisoners to be temporarily released "on licence", given time to recover their health, and then re-arrested on the original charge. To keep their leaders free for as long as possible, the militants established a secret society of "Amazons", known as the Bodyguard; a group of about 25 athletic, dedicated women trained in the martial arts, who provided security escorts for suffragette leaders released under the Cat and Mouse Act. Largely self-taught in the crafts of espionage and subterfuge, they made effective use of decoy and deception tactics and sometimes resorted to outright street brawling with the police. The Mrs. Pankhurst's Amazons trilogy is inspired by their adventures. However, the outbreak of the First World War brought an end to most militant suffragette activity, as Emmeline Pankhurst reasoned that "Votes for Women" would be meaningless if England itself was conquered. Instead, she urged her supporters to throw their skills and strengths into keeping the country running for the duration of the crisis. For the first time in modern history, large numbers of women were suddenly liberated to do "men's work" such as driving trucks and producing munitions. Shortly after the end of the War, in 1918, 8.4 million British women won the right to vote. By 1928, true voting equality became available to all women aged over 21 years.